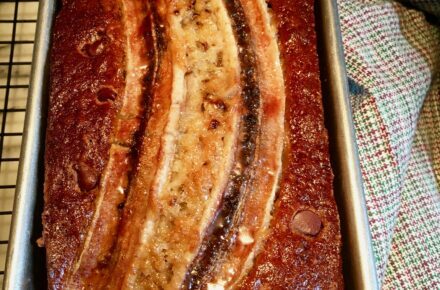 The smell of fresh banana bread baking in the oven is just irresistible. My neighbor next door knows what I’m cooking when she smells something good coming out from the windows. 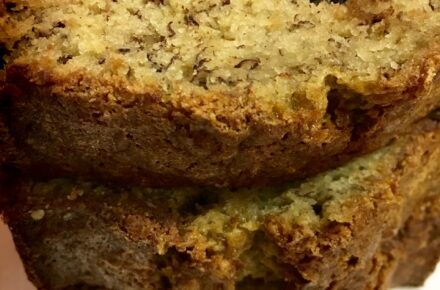 I love to make banana bread especially when there are ripe bananas on the kitchen counter. It’s a good way to make use of ripe fruit and make something delicious. 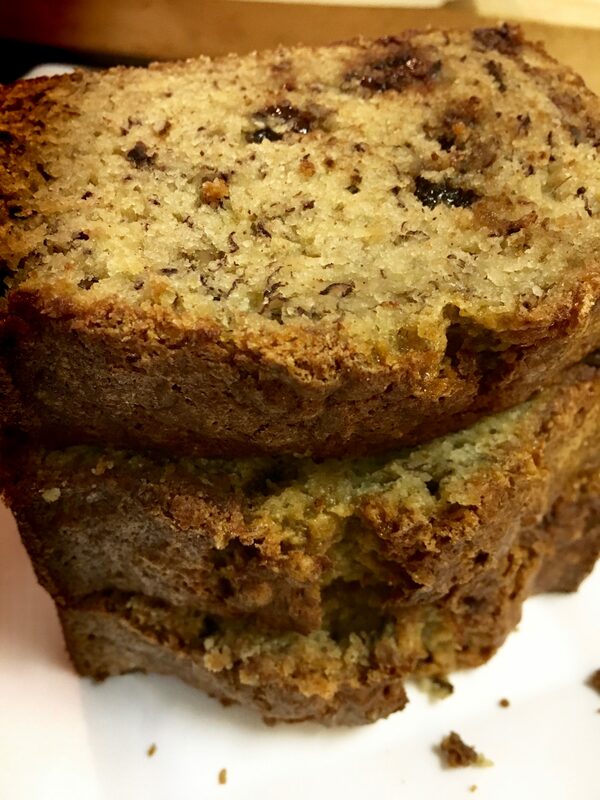 It is one of my favorite quick breads because first, it’s easy to make. Secondly, banana bread is quite nutritious. Bananas contain potassium, fiber and antioxidants. Then when I add crunchy walnuts and chocolate chips it even gets better. Walnuts contain Omega 3 fatty acids which is good for bone health, plus protein. Chocolate is known to be a powerful source of antioxidants. It’s a win-win! When I make banana bread I like to use ripe bananas that have just small dark spots because if they are over ripe (with bigger darker spots) they can have a bitter flavor. I also add just a bit of cinnamon to enhance the flavor. A little bit of half and half makes it so moist. Then, before I pour the batter into the loaf pan, I butter the pan and sprinkle it with a mixture of cinnamon and sugar. This cinnamon sugar becomes a layer of crusty sweet goodness! Oh and I also sprinkle the top of the batter with this cinnamon sugar after I pour it in the loaf pan. I usually have a little extra batter to make a few mini cupcakes which my son enjoys, or enough to fill a mini loaf pan. While it’s baking, the whole house smells good! 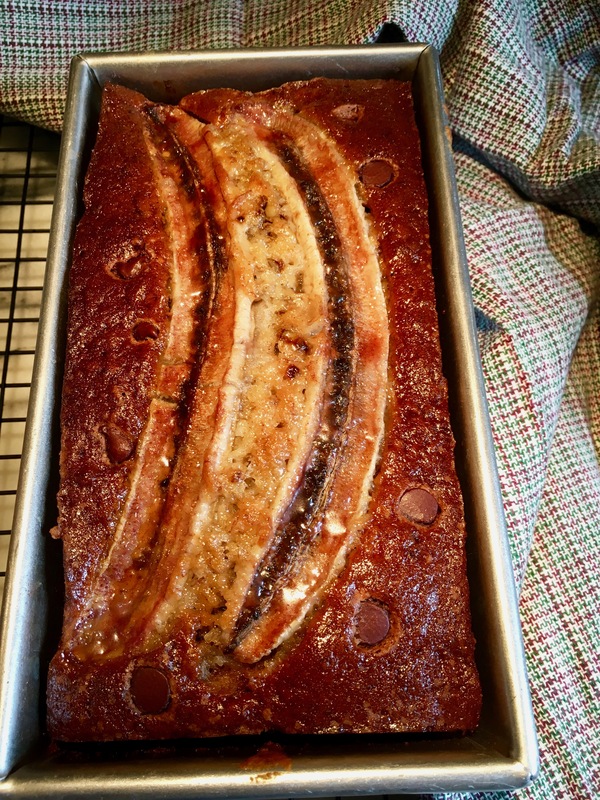 So I hope you use your ripe bananas and try making this banana bread. It is great for breakfast with coffee or tea, as a dessert, or as an afternoon snack. The bananas, walnuts, and chocolate in it are all packed with nutrients. Happy baking! Preheat oven to 350 degrees. Grease a loaf pan with butter. Whisk together eggs, half and half, and oil until combined. Set aside. In a bowl combine flour, baking powder, baking soda, salt, and 1/4 teaspoon cinnamon. Set aside. Mash the 3 bananas and add sugar. Whisk together until watery. Pour the egg mixture slowly into the bananas with sugar. Beat for 1 minute. Add the flour mixture and continue beating for 1 minute until well combined. Stir in walnuts and chocolate chips. Mix together 2 Tbsp sugar and 1 tsp cinnamon. Sprinkle the mixture on the bottom and sides of the buttered loaf pan. Pour batter into loaf pan up to 3/4 full leaving about 1/2 inch space from the top of loaf pan. Slice 1 banana lengthwise and top the batter with 2-3 slices. Sprinkle the top of the batter with more cinnamon sugar. Bake in the oven for 1 hour. If you use a 1 1/2 quart loaf pan, you will have leftover batter enough to make a few mini cupcakes or 1 mini loaf pan. These will cook in about 25 minutes.